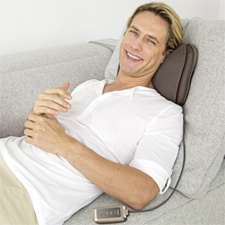 The Beurer MG147 Shiatsu Massage Cushion is the perfect addition to your sofa! A simple cushion with mighty results; the Beurer MG147 Shiatsu Massage Cushion delivers an intensely soothing Shiatsu massage where you need it most. The Shiatsu massage is known in traditional Far Eastern medicine to help encourage healthy, emotional, physical and mental well-being. The concept behind a Shiatsu massage is that the techniques used in practice; the rubbing, squeezing, kneading and tapping help to unblock blockages and restore energy. This then provides pain relief that is non-invasive, enjoyable and is a more efficient way of removing toxins in the body. You can also use the light and heating option to achieve an even more delightful massage; using the massage cushion on a specific sore area will promote healthy blood circulation bringing oxygen to the area it is needed most. The massage cushion can be used across the back, the neck and legs to relieve stress, aches and pains. The rotating massage heads have 2 massage direction settings; they rotate in pairs in opposite directions, perfect for those who suffer with a stiff neck; just prop the massage cushion in the desired place, close your eyes and relax. The massage cushion will use the same techniques as a Shiatsu masseuse to really help you unwind. But the Shiatsu massage cushion isn’t just for the home; you can take it to work too. If you are desk bound for the majority of the day, you can often experience tensed muscles in your back due to a poor posture. The Velcro straps can fasten to the back of your office chair and you can enjoy a deep massage whilst you’re catching up on your emails – the soft mesh that surrounds the rotating heads makes it even more comfortable to use on targeted areas. The cover is also washable so you can add a few drops of your favourite washing conditioner to really enjoy a Shiatsu massage. Have a Shiatsu masseuse wherever you go; the Beurer MG147 Shiatsu Massage Cushion is the perfect helping hand.